The earliest known pewter was made in China 2,000 years ago. But tin was used by the Egyptians as early as 3700 BC and is mentioned at least twice in the Bible. The Romans used pewter for seals of office and other small devices. The Roman occupation of Britain had much to do with securing the English tin, copper and lead mines of Cornwall - The greatest in the world at the time. Through the Middle Ages and Renaissance, tin, lead and copper continued to be England's major export, second only to wool. In 1290, Edward I had over 300 pewter dishes, salts, and platters. He seems to have had no silver plate at all. By 1390, pewter plates and utensils came into common use by the nobility and high churchmen in France. "The Worshipful Company of Pewterers" of London dates back to 1348 in the reign of Edward III, and regulated pewtersmiths in order to maintain a high quality of pewter. 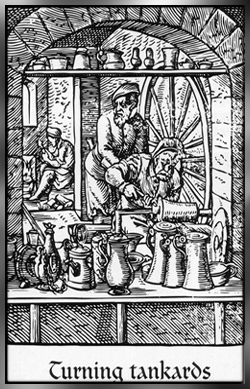 By the 15th century, pewter was in use by all classes. It reached it's peak in the 17th century with master pewterers in Brussels, Nuremberg, Paris, Antwerp, London, Boston, and New York. With the mass production of porcelain tableware in the 18th century, the popularity of pewter crockery declined. And finally, by the Victorian age, electroplating cleared pewter utensils from our tables. But while the quantity declined, the quality craftsmanship rose with some of the greatest works of Art Nouveau and Arts and Crafts periods being cast in pewter. Pewter remains a choice metal for modern sculptors, and in that tradition Fellowship Foundry is creating the finest pewter being cast today. Copyright 1996 Christopher Knight & Fellowship Foundry.